I am back in my hometown, Taiping with J! Yes, finally everything is over, I am now graduated, or can be said unemployed. Since I’m now in Taiping, you can be sure to look forward to lots of food review. But for that, you got to wait. I have something up my sleeves, and well, you will know soon enough. As for now, J and I went up north to Penang yesterday, in a half day trip, big part of the reason is for food hunting. So, J had stayed there before during his internship, and so he know a few places, though that time he only cycled to work, oh yes, to skip the crazy Penang traffic, he did not get to go out much, especially to town. But yesterday, base on his male direction instinct, he took me to the best part in town for good eats that is Air Itam. We went in hunt for laksa, a peranakan spicy dish, richly blend with best of Chinese and Malay Cuisine. J took me to a reputable laksa stall in Penang, located along the street in front of Kek Lok Si Temple (the famous Buddhist temple in Penang). One bite into the laksa, and I am sold. So many years in Malaysia, I though I had ate all types of laksa (curry laksa, assam laksa, bias to Chinese or Malay laksa, with all level of tastes. 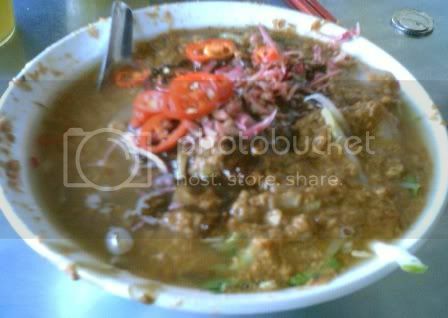 But now I have reopened my taste buds to a whole new experience with this Penang assam laksa. I ate it and drank the soup till the very last droplet, well nearly. The mee has a good springy texture, and it was served with good swirled of He Kor (prawn paste), thus the sweet taste. The soup is full of fish flakes (my favourites) and the broth is rich yet not overpowering. 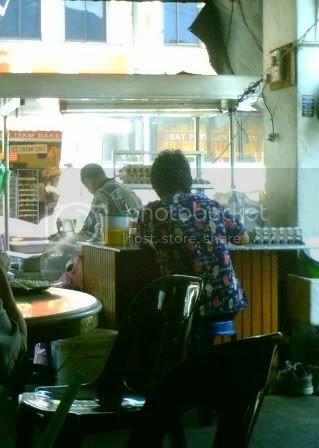 The stall is manned by an old man and an old lady, who worked at lightning speed to serve up a bowl. One look and you know they had been selling for years. The table has a gigantic of laksa mee with two huge pots bowling hot broth. Though seemingly unbelievable, but I’m sure they can sell it all by night. There is also a stall beside which sells freshly squeezed sugar cane. I was really too full to completely lick the bowl clean because, right before laksa, we went to line our growling stomach with char kuey teow first. You wouldn’t want to eat laksa in an empty stomach, or you are sure to suffer burn. Laksa is really tart with although I’m not too sure of the scientific components, we all know it’s really acidic and can cut through your tummy. 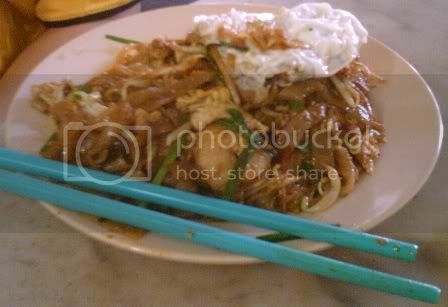 Besides, who can go to Penang and not to eat char kuey teow? 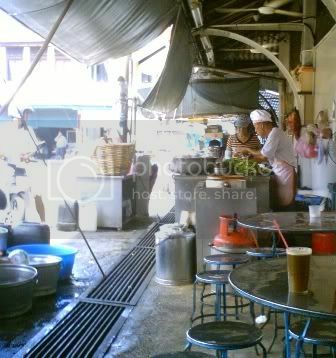 This char kuey teow stall is located just across the road from the laksa stall, in a true old style restaurant. The kuey teow was really tender, with loads of flavour infused in it. The prawns and cockles are fresh, and as an authentic Penang style, it was added with sliced lap cheong (Chinese stuffed pork, sausage style). Though this might not be the best char kuey teow in Penang, but I am darn sure I ate the best laksa in town! Ah, I am satisfied that I have ate two of Penang’s most famous food, the indisputable char kuey teow and the bowl licking laksa. wow.....u just made me wanna go back to Penang for makan again..
Aww...to travel to Penang..its at least a 9 hrs drive...haiz!!! That's my fav laksa stall!!! arrgghh.. u made me miss home even more! btw, (with the risk of sounding too "action"), you got my URL wrong. Just the same, thanks for linking me. OMG Penang FOOD!!!!!! I pengsaned when I looked at the char kuay teow. Thanx a lot for the visual treat, Rachel. Missing it a LOT. What is that assam laksa.... anything to do with Assam in India??? foodcrazee, i wanted to go back to Penang for food again too! Is that stall really that good? I was there but I peered at his pots, I was put off and did not try at all. domestic rat, it was good really. what's wrong with the pot? Oh my, just reminded me of the Pulau Tikus, Penang, assam laksa and char koay teow. Must try and go back next month, craving already lor!